The Production Coordinator works with the Producer and Production Manager throughout the production. Together they are responsible for overseeing the smooth running and coordination of a production. Further, the Production Coordinator is responsible for supervising any assistant production staff. Production Coordinators can often be found working on a variety of television productions to include; reality TV, dramas, comedies, news and, current affairs. In some cases the Production Coordinator may specialise in certain areas and thus also be known as the Production Assistant, Production Secretary or Script Supervisor. Immediately after the beginning of pre-production, the Production Coordinator sets up the production office, taking care of providing equipment and supplies, as well as hiring staff. They are also responsible for organising the travel and subsequent accommodation for cast, crew and other members of the production team. Often this means they will be responsible for acquiring the relevant paperwork, such as work permits and visas, and organising insurance. In some cases the Production Coordinator may also be responsible for creating and distributing calls sheets and schedules. Further, they may be required to edit and revise scripts. During shooting, they deal with day to day updates such as crew and cast list changes, call sheets, script edits and so on. They check the transport requirements for the day and make sure everything is delivered on set, on time. At the end of the shoot they assist the Production Manager to wrap the production, closing accounts with suppliers and returning excess stocks. In big-budget productions, some of these tasks are delegated to Assistant Production Coordinator, Production Assistants or Runners. Knowledge and experience of the film making process are key to integrate all of the necessary tasks under their supervision. This also requires multitasking skills, efficiency, organisational skills and being able to solve problems under pressure. Both teamwork and self-motivation are a requirement for this role, as it involves working with peers and superiors, but also being in charge whenever the Production Manager is busy on set. Further, the Production Coordinator must be able to navigate and plan around varying crew schedules. IT and financial management skills are needed, especially for the final stages of production when most of the Production Coordinator’s job revolves around accounting operations. Salary, as always, will depend on the amount of experience you have of working within the Production Department. 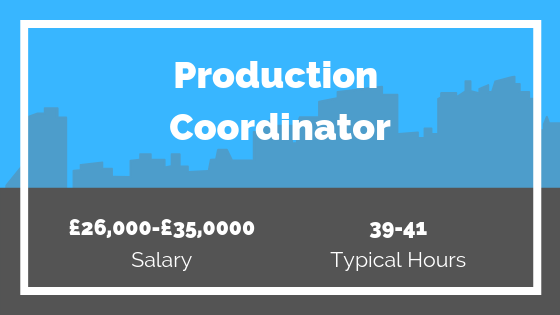 According to BECTU, the Broadcasting Entertainment Cinematograph and Theatre Union, a Production Coordinator can expect to earn anywhere from £22-£33 per hour. According to Televisual’s 2016 survey, the average salary for a Production Coordinator was £30,000. In this job role, working hours can be long and at times unsociable. Thus, stamina will be key if pursuing this career. This job role would be suited to someone who does not mind traveling for work, as often the requirements of a production require traveling to other countries for lengths of time. The entry-level role within the Production Office is the Production Runner. After gaining some experience, it is possible to progress to Assistant Production Coordinator before finally landing this role. Previous experience in production offices, even in advertising or corporate video, as well as any office management experience, are highly valued. There is no specific qualification for this job. However, health and safety courses, along with a full EU driving license, are generally required. Additionally, in what is an increasingly competitive industry a degree can help to differentiate you from the crowd. If education is the route in that you are looking to pursue, you could look to gain a qualification in; Business, Management, Film Production, Media or Accounting. Institutions such as the MetFilm school, a world-leading film, television and online media school offer lots of undergraduate, postgraduate and short courses which could help you get that first step into the industry. If you are lacking experience, which is generally essential for this role, you could look to volunteer at local community productions to gain some general experience. Progression from this role involves a lot of hard work and networking. It is important to constantly develop your skills and keep on top of the latest developments within the industry. With hard work and perseverance, you can look to progress to working as a Production Manager, with the opportunity of progressing to be a Line Producer. If you are ready for the next step in your career, why not take a look at the latest Production Coordinator vacancies on our jobs board? You can view our latest vacancies here.